Baxton Studio Light Cappuccino Doniea Leaning Floor Mirror 31.5W x 71H in. Baxton Studio A lot goes into the making of Baxton Studio furniture, and it all starts with attention to details. They hand select their unique line of leather and micro-fiber fabrics. Their furniture is padded with high polyurethane foam to create the body contouring comfort and support for which Baxton Studio is famous. All frames are constructed of high quality wood or steel on select models, providing sturdy frame construction that exceeds industry standards. Baxton Studio is committed to constantly providing stylish and unique furniture for the best value to help you create a comfortable living space with ease and confidence. Overall Dimensions: 31W x 1D x 71H in. 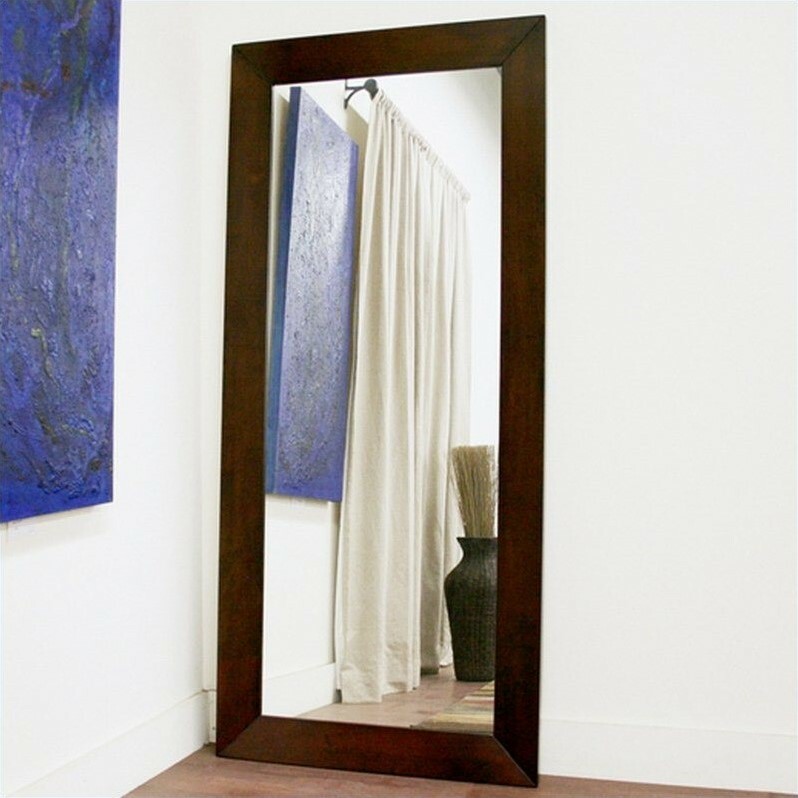 Mirror dimensions: 22W x 62H in. Mirror arrived in great condition. It was also double boxed and wrapped which shows care was taken to ensure it would arrive in great condition. I gotta admit I was nervous as I read the reviews on broken mirrors after I ordered mine, however, that was not my experience with 2 different mirrors I ordered here. Both of which look beautiful and arrived in great condition. Calling 2 different people over the phone one was very to ask and make sure i'd be taken care of should anything come broken I was given piece of mind... One of the people I spoke to was pleasant, and very helpful. The first one I called not so much where I felt some rudeness hence the 4 star rating rather than 5 stars. All in all however, the product is great, and arrived perfectly, and it looked like it was due to great careful packaging by hayneedle. Home territory searches the web to find the best prices and availability on Mirrors and related products foir your home like Baxton Studio Light Cappuccino Doniea Leaning Floor Mirror 31.5W x 71H in.. For this page, related items include products we find that match the following keywords: "Mirror" at our vendor partner Walmart - Click More Info / Buy Now to check for price rollbacks!. Baxton Studio Light Cappuccino Doniea Leaning Floor Mirror 31.5W x 71H in. is one of 68 Mirrors and related products available for sale through HomeTerritory.com, If you have any questions on this product, please give us a call at 734-971-1210 during the hours of 9am - 5pm EST for assistance. Thank you for shopping at Home Territory, the home furnishings superstore!